I was very inspired by a talk by Sarah Kay on Ted.com. She’s a spoken word poet who encourages us to write a list and then discuss it. It can be anything and you need to not think about it too hard. So here goes. 1. When your child/student tells you you’re the best mom/teacher ever, it probably means that you said or did something that you didn’t think through. Yeah, go ahead and have that soda. Before bed time. 2.Most kids don’t learn to like something. They learn to dislike something. And they learn that from us. 3.Kids will almost always do what we do and never what we say. Grown ups are the same way. 6.No man is an island. Or an archipelago. 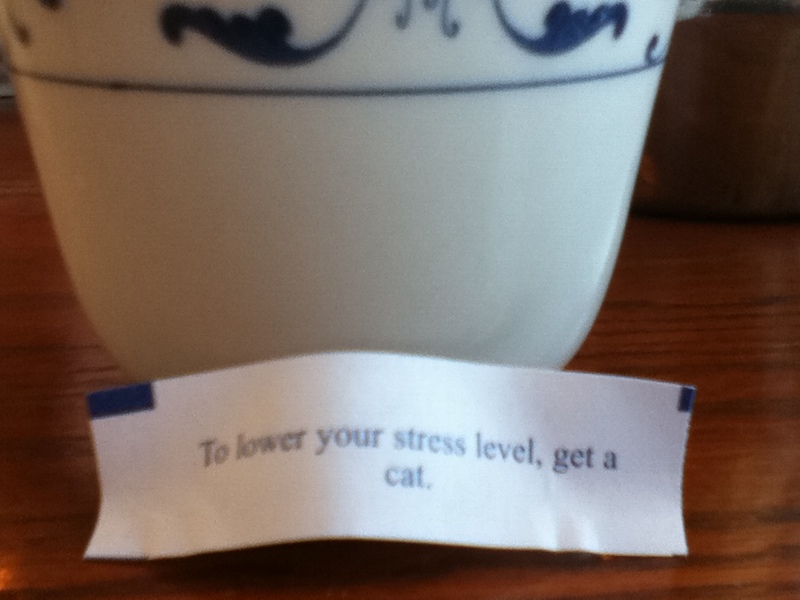 8.Fortune cookie’s do not always have your best interests at heart. Really? A cat? 9.Thai Basil Eggplant at Thai Chili is really the most amazing dish I’ve ever eaten. 10.You can buy your children the smartest, most educationally sound, creative toys, but their favorite will always be the annoying Donkey Shrek toy from a Happy Meal that yells at you. Until you shut it off. I look forward to reading your 10.